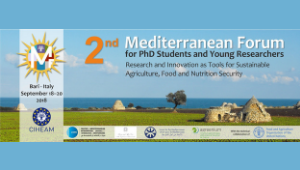 PhD students and young researchers will meet at CIHEAM Bari, from 18 to 20 September, to participate in the second Mediterranean Forum on “Research and Innovation: tools for Sustainable Agriculture and Food Security”. This event intends to lay the groundwork for this initiative of dialogue and sharing in the field of research and rural development of the Euro-Mediterranean area to become permanent. 175 participants from 27 Countries (Albania, Algeria, Bosnia, Chile, Egypt, France, Jordan, Great Britain, Greece, Hungary, Haiti, Iran, Iraq, Italy, Lebanon, Libya, Morocco, Macedonia, Netherlands, Palestine, Russia, Serbia, Syria, Spain, South Africa, Tunisia, Turkey) will offer their valuable contribution to the discussions on issues related to the challenges of sustainable development and agriculture in the Mediterranean Basin and the objectives of CAPMED 2025 (Strategic Agenda of CIHEAM, in line with Agenda 2030 of the United Nations): Protecting the Planet, Fighting Waste, Food and Nutrition Security, Inclusive Development and Crisis and Resilience. The works will start on 18 September (9:00 AM) with the welcome address of Maurizio Raeli, CIHEAM Bari Director, Placido Plaza, CIHEAM Secretary General, Giuseppe Provenzano, Union for the Mediterranean, Janette Uhlmann, Center for Mediterranean Integration. During the three days, among other initiatives, success stories will be presented and some doctoral theses will be illustrated in 180 seconds. Three Maghreb women will also tell their stories on water-related issues. The second MEDFORUM for PhD students and young researchers is organized by CIHEAM (Centre International de Hautes Études Agronomiques Méditerranéennes) in partnership with FAO, MAECI (Ministry of Foreign Affairs and International Cooperation), CMI (Center for Mediterranean Integration), UfM (Union for the Mediterranean), Agreenium (Institut Agronomique, Vétérinaire et Forestier de France).